A dedicated survey focusing on investigating coastal dolphins has never been conducted in the UAE nor in any area of the Gulf. Whales and dolphins play a crucial role in the marine ecosystem. Being at the top of the marine food chain, together with other species such as sharks and top marine predators, they are “Ecological Indicators” of the status of the sea. The presence of a healthy dolphin population means that the marine environment can sustain them and therefore is in good condition. Although over ten species of whales and dolphins have been reported, the Gulf is considered as “data deficient” by the international cetacean scientific community and no baseline information is available on the status of the dolphin population: prevalence of species, whether they are resident, transitory, or whether the populations are declining. In UAE, the only information available on small cetaceans comes from two aerial surveys on dugongs conducted in the Abu Dhabi area in 1986 and 1999. Although species were not identified, authors estimated a decrease of 71% in small dolphin sightings in 13 years (Preen A., 2004). The rest of the UAE coastline has never been monitored for small cetaceans, but in several areas dolphins are regularly seen. 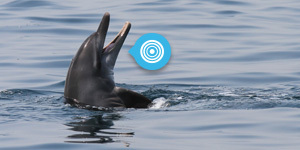 Based on occasional records at least three species of dolphins are reported to frequent the Dubai coastal waters: the Indo-Pacific bottlenose dolphin, the Indo-Pacific humpback dolphin and the rare finless porpoise.